No partner needed. We rotate partners frequently in class. Beginners always welcome! Live Music Dance Party & Cocktails after class! Class and party dates: April 3, 10 and 17 (3-week session) at Swedish American Hall, SF. April 24: dance party offsite at Local Edition, no dance classes. Save $15 or more when you sign up early! In this class, you will learn the basics of Lindy Hop, the original swing dance from the 1930s that features fast footwork and addictive rhythms. You’ll learn the basic 8-count steps that every lindy hopper should know — swingout, lindy circle & charleston — plus solid lead and follow technique and a different set of beginner level steps each month. This class is a progressive series, which means we review and build steadily upon previous weeks’ material. Previous swing dancing experience is helpful but not required. To get the most out of the class, we recommend that you are already comfortable with “triple-steps” — if you don’t know these yet, we suggest taking our 9pm drop-in swing class a few times first. Karen came to the Bay Area from Portland, where she regularly danced Lindy Hop and Blues. She started training in dance at the age of 3 and discovered swing dancing as a high school student. In college, she helped run the swing dance club and participated in the ballroom dance team as a member and coach for several student groups. She's an avid social dancer in San Francisco and has performed with the Someday Sweethearts and Nathan's Swing or Nothing dance troupes. 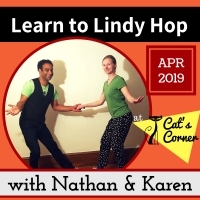 Karen and Nathan recently taught their first Intermediate-Advanced Lindy Hop class at Cat's Corner, and they had so much fun that Karen decided to return for more! In this class, you will build up your repertoire of lead and follow techniques, classic lindy hop moves and styling. Students wishing to join the Intermediate class must have completed our 4-month Beginning Lindy Hop program (or the equivalent) as well as a friendly level-check with one of our teachers. Students should be regular social dancers at this point, and should be able to confidently dance the steps listed on our 4-month Beginner curriculum (click the “Beginning” tab above) including 6-count turns, 8-count swingout, Lindy circle and related turns, and basic Charleston patterns. Contact the teachers to arrange a level-check and get class level advice. Stretch and grow as a Lindy Hopper by focusing on important fundamentals: connection, musicality and momentum while learning and dancing more complex patterns, challenging lead and follow techniques, and impressive styling. Required: 6+ months of Intermediate Lindy Hop classes and social dance experience, or the equivalent. You should be able to incorporate some common footwork variations in your basics, independent of your partner (i.e. kick-ball-change, heel pops, Al Minn’s footwork, scissor kicks, Frankie’s footwork). You should be able to dance at least a few classic lindy hop “flashy” patterns such as: Curl & Points, Mini-Dip, the Chase, Sailor Kicks, Hacksaws, Behind the Back Promenade, Quick Stop, etc. There is no formal level-check, and student placement is by honor system. Teachers, however, are instructed to, at their discretion, politely send unqualified students to the appropriate level. When in doubt, the best is to arrange a friendly level check with one of our teachers. Philippe Wilson is all about listening to the music and his partner, and interpreting both with exquisite flair. He combines precise leads with musical integrity, creating a dynamic dance that feels great in all the right ways. Although Philippe has rocked some competitions, his first and true love is social dancing. He loves questions and is always seeking better understanding of what makes dancing great. Philippe learned to dance and teach in Austin, TX, where you can dance to live music nearly 8 nights a week. He now lives in the San Francisco Bay Area where he’s designing very cool things for very cool mobile devices. Chiara Coombs started her swing dance journey while living abroad in Seoul, Korea. Having studied classical harp since age seven, she instantly fell in love with Lindy Hop as a new way to express herself. She currently performs around the Bay Area as a member of the chorus girl troupe, Someday Sweethearts, and San Francisco-based group Swing or Nothing. She spends her time practicing, performing, and working part-time as an ESL instructor (while attending graduate school). Chiara wants her students to learn to express themselves musically through the dance along with giving them a solid technical foundation. Chiara invites her students to enjoy the learning process through hard work and lots of fun! 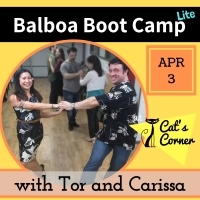 Requirements: These classes assume no previous experience with the specific dances being taught, but do assume previous partner dance experience and are geared toward students who have completed at least 4 months of Intermediate Lindy Hop classes at Cat’s Corner (or the equivalent). Experience the subtleties and close connection of Balboa, a swing dance style that originated in southern California on the Balboa Peninsula and is characterized by its closed position, body lead, intricate footwork flourishes and simply efficient basic step perfect for dancing to extremely fast music and on crowded dance floors…without breaking a sweat! Explore West Coast Swing and take the smoother, more sensual member of the swing dance family out for a spin! Originating in California, West Coast Swing has roots in Lindy Hop and represents an adaptation of swing dancing that accompanied the shift in popular music away from Jazz and Big Band toward Blues, R&B and eventually contemporary music. 2 time US Open Swing Dance Champion Melissa Rutz and partner Parker Dearborn will help you get a taste of West Coast fun and flair! Enjoy this snappy swing dance that explodes with energy and features a unique double-rhythm six-count basic and eye-popping footwork, plus animated movements that will whip you into shape and invigorate your dancing! Collegiate Shag is currently in the midst of a huge worldwide revival. Join the movement and give it the old college try! Costs: $20 early registration by Monday before the class. $22 full price online / door. $18 if registering online for multiple classes (must be qualified for highest level class). Amy is a self-identifying Shagaholic. She is a former member of Steve Sayer and Chanzie Roettig’s LA Shag, and of Johnny “Bluejeans” Lee’s The San Francisco Jitterbugs, and is very excited to be starting her own Shag team here in the Bay Area. As a method of sharing her love of dance she teaches, competes, performs, and helps organize dance events. She is very excited to be sharing her love of this dance with you as she continues on her journey to make Collegiate Shag more visible and increase its presence in the Bay Area. She hopes you will love it as much as she does. Maia Paddock has been trying out different forms of dance for as long as she can remember, starting off as a tiny child in ballet, tap, and gymnastics, becoming a competitive Irish dancer throughout high school, and finally discovering lindy hop in college at UC Davis. By her senior year of college she was running the Davis Swing Dancers Lindy Hop performance team, The Tranky Moo, teaching both lindy hop and solo jazz routines. 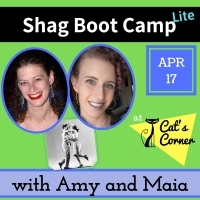 Shortly after starting Lindy Hop she began dancing Collegiate Shag, Balboa, and solo jazz, becoming especially involved in the Collegiate Shag community. She is a relatively new transplant to the Bay Area and is loving all of the opportunities to dance, teach, and perform! Series class sizes are limited and often sell out. A few extra spots are also made available to our staff volunteers. All of the Lindy Hop classes are progressive, with each week’s material building on the previous week’s class. Lindy Hop drop-ins are allowed for $20 which also includes dance party and 9pm lesson admission. Please note that if you drop in to one of the classes, it may be in the middle of the class series, and you may fall behind. We recommend that you take the full series. We always offer a drop-in Beginning Swing class each Wednesday from 9:00-9:30pm. Not sure which class is for you? Send us an email with any questions!